PR is different in different companies and the aim is to align employees to the goals of the company. But all said and done PR can create mixed emotions in employees and many feel stressful to know the shortcomings. Performance reviews thru ratings also have shortcomings because of the bias in the perceptions it carries and it is imperfect science. So in many ways Performance reviews are having challenges that will not bring the best intentions of the management nor satisfies employees. I felt this whole exercise needs to be redefined in different ways. The following are my thoughts on this. Please do not hesitate to add your feedback or comments. This exercise should be preferably done by HR or Admin teams. For the present financial year, HR with help from sales, marketing, and management teams should prepare a chart. That should contain details of required skills, competencies, overall revenue targets, expected sales, expected new skills, competencies needed etc. in the form a visual representation. This competencies/skills can be categorized on employee designations if needed and corresponding revenue targets should be matched. 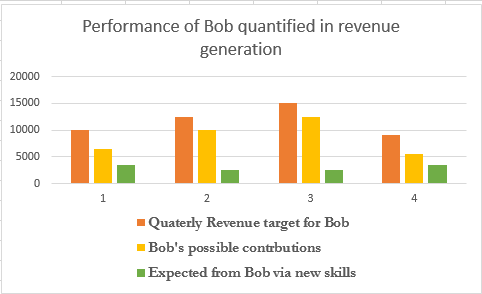 By categorizing the required competencies of each area and matching the same with specific employees skills will throw open the gaps that still need to be fulfilled by Bob. Revenue targets that matches the above employee’s skills, competencies, experiences should be matched to each employee and discounted. Now it becomes clear that there will be gaps due to forecasted sales in areas that need new competencies, or deficiencies in certain areas for people whose role needs that skill or competency or experience. That should be made visible to employee and employer in a centralized location and accessible to everyone. As the employee meets the revenue targets or skills targets in the form of deliveries in the new skills area, data values of the above graphs should be adjusted during the year. That will instantly provide information to both employee and employer about the performance of every one. Same exercise should be repeated for any other target areas such as employee’s growth, special contributions etc. as needed by the company. There are several advantages with the above method. It makes employees to check their improvements as and when they want and becomes a major morale booster when they see the graph’s real time changes. It helps management to take corrective action and help employees as needed. PR exercise becomes much easier, seamless and highly visible. Ultimately every PR aim is to achieve high productivity, keep employees happy, equip them with skills that are needed, help them to grow along with the organization, pay well and at the same time make sure the company’s target goals are achieved. What helps firms to become successful in reaching their goals is by documenting major risks, issues, potential problems, Known resolutions, ways of mitigating issues (example https://en.wikipedia.org/wiki/Andon_(manufacturing) ) and helping employees to have access to the knowledge database so they won’t repeat the mistakes.